Sweating windows. Damp carpeting. Speckled shower curtains. These and many other “tells” signal the presence of household moulds, but unless you know what you are looking at, mould can hide in plain sight and you won’t see it. However, often, you and your family can feel its presence. Sore throats, runny noses, itchy eyes, headache, fatigue, coughing and sneezing, asthma attacks—these signs can also indicate mould is beginning to infiltrate your home’s indoor air. In this article, we give you the information you need to sleuth out—and clean out—toxic winter mould wherever it may be hiding in your home. 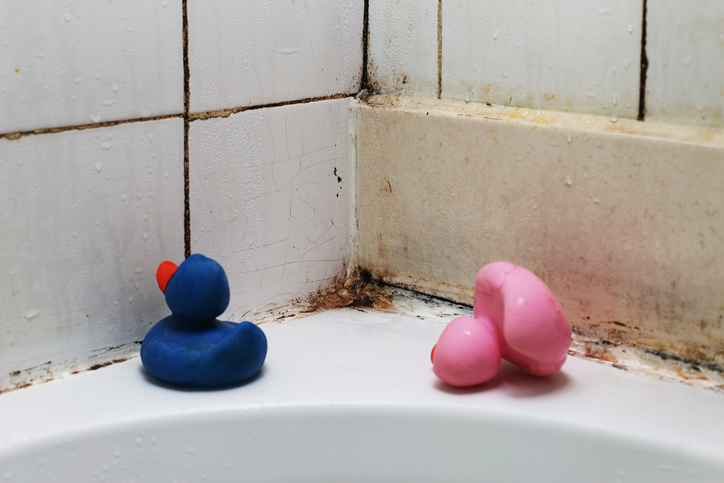 Mould can be particularly sneaky in winter, because most homeowners assume this is the season of lowest mould risk. After all, summer is when everything gets hot and damp and muggy, right? Unfortunately, cooler temperatures don’t necessarily prevent mould from growing, especially if all else is ideal. No one likes a cold bathroom floor, especially first thing in the morning. Luckily, most people today don’t have one, thanks to central heat, space heaters, or radiant heating. But what are two things mould absolutely loves? Warmth and damp. This makes the bathroom one of mould’s favorite places to hang out. Mould also loves kitchens. All that water, so much steam! When the kitchen adjoins the laundry room, even better. Often, allergy-prone family members choose to run a humidifier in the lower humidity winter season. This can be great to ease itching and irritation in dry, sensitive respiratory tissues—provided you clean out the humidifier frequently. Otherwise, mould can begin to grow inside that wonderful humid, damp, enclosed humidifier bowl. Once it grows there, it can travel via the humidifier’s steam and take root in other favorable places. Not only do you need to keep a close eye on the basement to ensure winter runoff doesn’t seep in through the cracks and monitor your septic to ensure no blockages cause flooding, but now you need to keep an eye out for mould as well. The basement is one of mould’s favorite areas because few homeowners look there for mould. They are too busy looking there for other potential problems, so mould can hide out in plain sight and remain undisturbed. But if you smell a dank, “grassy,” or musty odor or see your flooring or walls begin to turn a distinctive grey or greenish color, you have received mould’s signature calling card. Storage areas and outdoor sheds make particularly great homes for mould, since it can grow easily on damp cardboard, paper, wood, drywall, carpet swatches, rags, and work clothes. According to Toronto’s Public Health website, more than 270 different species of mould have been catalogued and documented living inside homes in Canada. That’s a lot of mould! The good news is, you don’t have to know precisely what species of mould you’ve found in order to start cleaning it up. You can easily clean small and medium-sized mould patches (of 3 feet by 3 feet or smaller) yourself after taking a few safety precautions. What to wear: Disposable dust mask, rubber gloves, protective goggles, work clothes, and shoes. What to use: Unscented detergent or a mixture of bleach and water. What to do: Use a clean rag or anti-microbial scrubbing sponge to quickly scrub the affected area with the cleaning solutions. Then rinse and dry the entire area THOROUGHLY. If you find a larger mould patch on the premises anywhere in or around your home, it is best to call the pros. This is for your safety, since you don’t want mould spores entering the air and traveling to start a new colony elsewhere in your home. Make your use of humidifiers rare and clean them rigorously after use. Keep all spaces well-ventilated using regular and exhaust fans. Clean out your indoor air ducts and clothes dryer vents (and right now, get 10 percent off any package). Be vigilant about spotting and repairing leaks in water pipes or fixtures. Limit indoor terrariums or fish tanks, which add more humidity to the air. Switch to HEPA filters to keep your indoor air cleaner.